If you have an itchy scratchy dog, or a dog with hot spots and sores, the first step is to find out why. With skin disease, diagnosis is the first step to a cure. There are many reasons why a dog might have skin problems. ‘Atopic’ means that the tendency is inherited and runs in the dog’s breed or line. ‘Dermatitis’ means skin inflammation. Atopic dermatitis can be triggered by something the dog breathes in, something he eats, or something he comes into physical contact with. The dog’s immune system over-reacts to the substance he is allergic to, causing him to itch and scratch. Sometimes atopic dermatitis also involved conjunctivitis (eye infections), and his ears may also be red and hot. Inhalant allergies are caused by the same things that cause allergies in humans – tree, grass and weed pollen, dust mites, moulds and fungal spores, petrochemicals and other chemicals. If you notice your dog chewing at his feet and constantly licking, then he may have inhalant allergies. Other common symptoms include biting and scratching. The worst itching will be on his feet, hind legs, groin and armpits. Recurring ear infections are another sign that your dog may have an inhalant allergy. Sometimes inhalant allergies are seasonal, which gives you a clue as to what he might be allergic to. Homoeopathic vets can prescribe pollen remedies based upon the time of year the itching occurs. Homoeopathic remedies are also available for moulds, petrochemicals, and dust mites. Symptoms of food allergies may be ear scratching, head shaking, itchy skin, licking and biting back legs, rubbing their face on carpet, inflammation in their ears, coughing, and in rare cases vomiting, sneezing, and diarrhoea. Hot spots and skin infections can be caused by food sensitivities. Food allergies can also lie behind aggression in dogs. The exclusion diet can help you to determine the foods your dog is allergic to. Initially, restrict him to a diet that settles the allergy down. This could be chicken, duck or white fish, along with potato or brown rice. Hopefully you will find a combination that relieves the itching for a while. Then gradually introduce new types of food, one at a time. You might start with duck and rice, and then add chicken a week or two after the itching has subsided. If he starts itching when you add the chicken, you can assume that he’s allergic to chicken. Try this with all food types, and withdraw the food if he starts to itch again. I’ve come across many dogs who had terrible skin problems until they were changed to a natural raw diet – the skin problems cleared up when processed food was removed. This is the least common type of allergy in dogs. Some of the items that may cause a reaction are carpet (chemicals), bedding, grass, plants, and flea collars. Some dogs can be allergic to flea saliva. If you feed a natural diet to your dog, he is unlikely to attract fleas. Sure, the odd one may show up, but a naturally fed dog is unlikely to suffer from a flea infestation. One of my dogs had a flea allergy and I treated him for vaccine damage using Emotional Freedom Technique. The hot spot caused by the flea allergy resolved very quickly after this. If your dogs have a lot of problems with fleas despite feeding naturally, it’s worth having your house checked out for Geopathic stress. Natural flea treatments and repellents include Neem, Diatomacoues Earth(DE), garlic (in his food), and the B vitamins. There are several different types of Staphylococcus living on your dog’s skin – it’s normal! However, some dogs may develop an allergy to them. Bacterial allergies will cause hair loss that looks similar to ring worm. Conventionally, your vet would treat the affected areas with antibiotics. Natural antibiotics which can be used topically include colloidal silver, diluted grapefruitseed extract, honey, Propolis, and Neem (try one at a time). You could also mix calendula cream with a few drops of Propolis as a topical ointment. Candida is a common yeast that can cause serious health issues when it invades the body. A candida, or yeast, overgrowth may look like an allergy when it is not. Many medications, especially antibiotics, actually help the Candida colonies to grow even faster. Symptoms pointing towards a yeast overgrowth in dogs include a yeasty smell, dry or oily skin, fatigue, poor appetite, overweight, allergies, skin problems, nervousness, frequent diarrhoea or constipation. The digestive system depends upon good organisms called Probiotics, and these can be impaired when there is candida present. Probiotic supplements will help. Grapefruitseed extract is proven to have a strong growth-inhibiting effect on bacteria, fungi, parasites and viruses. Because of its extremely low toxicity, grapefruitseed extract offers a broad spectrum antimicrobial without the side effects associated with pharmaceuticals. It is effective against more than 800 bacterial and viral strains, 100 strains of fungi, and a large number of single cell and multi-celled parasites. Added to food, it’s also a good de-wormer. It can be added to food and also diluted and used topically. This is caused by a cigar-shaped mite that’s only visible under a microscope. It lives under the dog’s skin and is difficult to treat, especially in dogs who have a sensitivity to this condition. Dogs with this affliction can have a musty or mousy smell. Dogs with a strong and vital immune system should be able to keep this condition under control. Symptoms include fever, loss of appetite, red and scaly skin, cracked skin with oozing liquid, and loss of hair in circular patches. Sarcoptic mange is also known as scabies. It is a severe type of mange in dogs that can also infect humans. It is caused by a burrowing mite which causes dogs to itch frantically. The mite tends to attack the dog’s head and face, and cause large scabs. Signs include scabs, listlessness, fur loss and itching. Affected dogs should be isolated from other dogs. Their bedding and environment needs to be thoroughly cleaned. Other dogs in contact with afflicted dogs should be examined and treated if necessary. Harsh chemicals are typically used to treat mange, although these don’t particularly help to strengthen the dog’s immune system. Alternative treatments include Neem oil, which will kill mites without causing toxicity to your dog. Food-grade Diatomaceous Earth, also non-toxic, can be put on your dog’s coat and sprinkled in the home to kill mites through dehydration. Homoeopathic treatments for mange include Sulphur and Arsen. Alb. Supplements which reduce inflammation in the body include Transfer Factor, Limu, aloe vera, Serrapeptase, vitamin C, and zinc. In addition, because fatty acids are essential for skin health, a good fish oil will be of immense benefit. 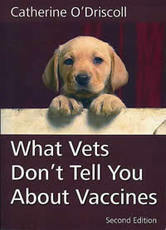 Vaccines are known to trigger allergies and atopic dermatitis, so treatment for vaccine damage by a holistic vet would be a sensible first step. The energy therapy Emotional Freedom Technique can also be used to treat vaccine damage and allergies. NAET is another energy therapy, and this is designed specifically to treat allergies. You can also consult a kinesiologist or radionics practitioner to find out what your dog is allergic to. Cod liver oil helps to relieve dry, scaly, itchy skin. Evening Primrose oil can be given alongside code liver oil. Hypericum and Calendula cream is a homoeopathic remedy which helps to soothe and promote healing of damaged skin. Kelp is a seaweed supplement that’s rich in iodine and other minerals. It helps to improve skin and stimulate hair growth. If kelp helps your dog, look for other symptoms of hypothyroidism. Zinc is used to improve skin and coat condition. Fish oils are also used to help improve skin condition.